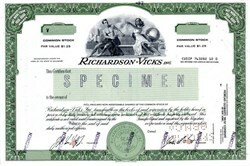 Beautiful specimen certificate from the Richardson - Vicks, Inc. This historic document was printed by the American Bank Note Company and has an ornate border around it with a vignette of an allegorical man and woman. This is the first time we have had this certificate for sale. Lunsford Richardson (1854-1919) began marketing various remedies in Greensboro, N.C. in 1898. The operation became Vick Chemical Company in 1911 and made increasing profits with its Vicks VapoRub cold remedy. The Company was managed over the following decades by Richardson's sons H. Smith (1885-1972) and Lunsford, Jr. (1891-1953). 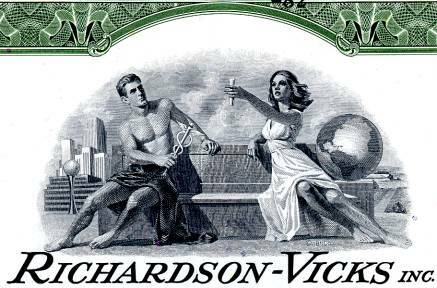 After various mergers and acquisitions, it became Richardson-Vick, Inc., in 1980. In 1985 the Richardson family sold the company to Procter & Gamble Co.